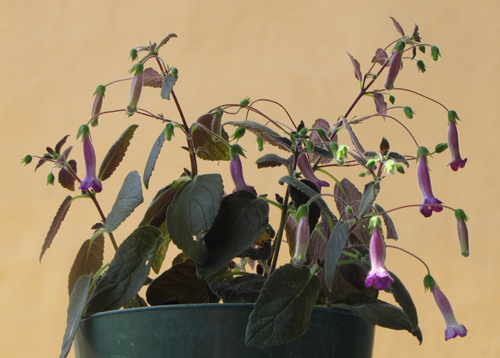 This hybrid, by Dave Zaitlin, combines Sinningia sellovii and Sinningia concinna. Macro x micro -- Dave thinks to do crosses that nobody else would! The result is a shrubby plant with many of the characteristics of the large-growing Sinningia sellovii but with the flower size of the micro parent Sinningia concinna. This picture was taken at the beginning of June 2013. The flowers show the color of Sinningia concinna, as well as the heavy spotting. 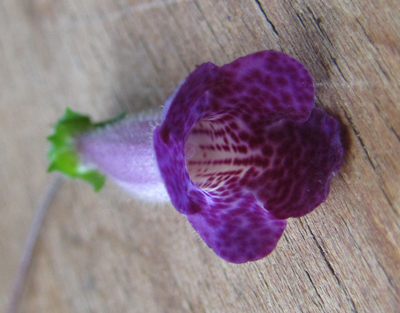 Flower size is scaled to that of Sinningia concinna as well: this flower is 1 cm across the face. Corolla tube is 2.5 cm [1 inch] long. It is lightly stippled on the outside, in the purple areas. The calyx is green. As can be seen from the picture, the petiole is green close to the flower but dark red away from it, the same color as the stem. The corolla is narrower than that of S. concinna, and the lobes don't flare as much. Like those of the Sinningia sellovii parent, the flowers are resupinate. It can't be seen in this picture, but the pedicel does a half-twist to invert the position of the flower, even though it dangles vertically. This is "Deep Purple Dreaming", sprouting in March 2013, after having spent the winter outdoors, and survived some freezing nights. The tuber is 4-5 cm [almost 2 inches] in diameter. By no means all of these shoots developed into stems, but they well illustrate the "Voices of Spring" cheerfulness of sinningias. The name Dave wanted was "Deep Purple", after one of his favorite rock groups, but there's a rule that hybrids can't be registered under a name which is identical to that of a color. Judy Becker, the registrar, suggested the name that was actually registered. Habit Shrubby, with unbranched stems. 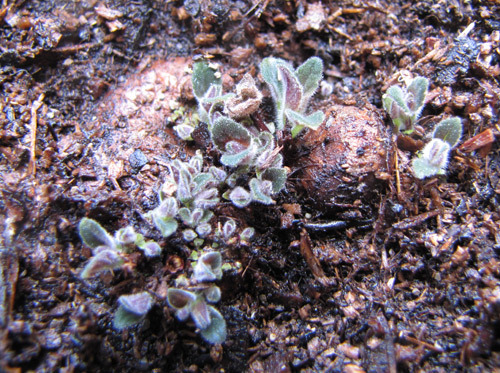 When there are multiple shoots from the tuber, the habit resembles that of a miniature Sinningia sellovii. Leaves Dark green upper surface, dark red backs. Length of blade: 4 cm or more. Length of petiole: 1 cm. Dormancy Stems fully deciduous. Dormancy appears to be obligate, at least in my yard. In this respect, it is like the Sinningia sellovii parent. Inflorescence Axillary cyme, with one or two flowers. When two, the second flower is in pair-flower position. Recommended? Well sure, what's not to like. It can tolerate cold! Taxonomic group Parents are both members of the Corytholoma clade. The hybrid might be fertile.